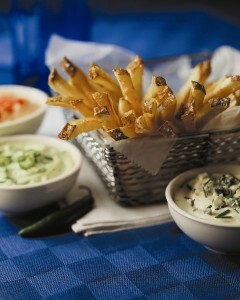 I am not doing anything different, why are my fries turning out dark and undercooked? The chances are that you just experienced a phenomenon called “the gap” or in laymen’s terms “old crop/new crop”. Idaho growers have been harvesting russet potatoes for a couple of weeks now and this continues through the middle of October. Idaho only harvests potatoes one time during the year (no multiple crops like Salinas can have with lettuce for example) and relies on state of the art storage at high humidity levels and temperatures around 45 – 48ºF, or sometimes a little cooler to be able to supply year round product. Some early to mid-harvest varieties, such as the Russet Norkotah, Ranger Russet, Classic Russet, etc. have a little shorter growing season and originally were developed to bridge the gap between the last of the Russet Burbanks (most frequently used for fresh cut fries) and the new crop. The first thing you are experiencing is frying an old crop, which can have the ratio of starch to water climb as the season finishes up and the potatoes are slightly more dehydrated than they were just a few months ago. That means the fries crisp up quickly and can often be the ones that your customers compliment your crew about when they mention the terrific Idaho homemade fries your restaurant serves. Some experienced operators ask their distributor or supplier to order in more “old crop” potatoes to carry them a little further into the new season. Nation’s Restaurant News recently had a terrific quote from New York Chef Daniel Boulud who said that when potatoes are typically harvested (beginning in August in Idaho) at that point their water content is too high to make excellent fries because they get soggy faster than an aged potato, so he works with suppliers to hold onto some old crop until October when the balance of water, starch, and sugar makes the potatoes just right for frying. Second, when you receive “new crop” potatoes you may find that the potatoes will have a different appearance, with a somewhat flakey skin, which happens when the potatoes are dug and don’t have a chance to go into storage and mature. This maturing stage heals over most cuts and bruises (called suberization) and stabilizes the skin, firming it up. It takes a month or two for this to happen. Of course, in a restaurant you can’t wait that long, so here is what we advise…We recommend that when you cut the potato for frying that you place it in running water until the excess sugars or starch have a chance to be diluted and the water runs clear. Third, We STRONGLY recommend that you blanch the potato and then store it for frying during the serving period. This makes for a more consistent French fry. You may experience a new potato fry turning dark before it is fully cooked. The blanching really helps offset this. At the beginning of the season (August to October) the Norkotah sometimes benefits from blanching at a lower temp (15 to 24 degrees) for an extra ten minutes, then finish frying at the same 350 to 375ºF as other russet varieties. What potato varieties do the chains that specialize in fresh cut fries mostly use? By far, the chains that sell fresh cut fries rely on the Idaho Russet Burbank variety. It has been the gold standard for French fries in the United States going back to longer than I can remember. When McDonald’s still made fresh fries, the JR Simplot Company sold them Idaho Russet Burbanks. McDonald’s switched to frozen fries back in the sixties, and now they are supplied by a combination of processors in multiple states (Lamb Weston, Simplot, and McCain’s all have dedicated lines just for their fries). 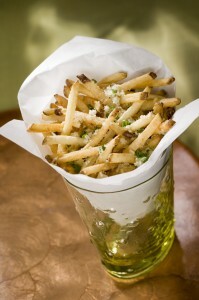 While they now use different varieties, using a high solids, low moisture potato is still the key to the perfect fry. Outback Steakhouse built their reputation for great fries on the Idaho Russet Burbank and up until recently made them from scratch. They also now use a more convenient frozen fry. It just makes economic sense when you factor in the need for consistency, controlling labor costs at the units, and pacing the volume requirements of a chain with over 800 locations. Charley’s Steakery, Steak Escape, Meatheads, Wingstop and the Five Guys chain prefer using the Idaho Russet Burbank when available. Mooyah Burgers and several others prefer the Idaho Russet Norkotah variety. Exceptions to the Russet preference include Ted’s Montana Grill, which uses a yellow flesh chipping stock variety potato and the Los Angeles based IN-N-Out Burger that specifies a Kennebec variety, also a yellow flesh chipping potato that has a light outer skin and does not accumulate sugars as much as some other varieties. Your best bet… order a French fry wall chart (bi-lingual English and Spanish) for tips on frying fresh or frozen Idaho potatoes and watch our foodservice videos on French Frying potatoes.